Glutathione-S-Transferase (GST) from Schistosoma japonicum. Our Abpromise guarantee covers the use of ab19256 in the following tested applications. WB 1/1000 - 1/10000. Predicted molecular weight: 24 kDa. IP Use a concentration of 1 - 4 µg/ml. ChIP Use 4 µg for µg of chromatin. GST (Glutathione S-Transferase) is a 26kDa protein encoded by the parasitic helminth Schistosoma japonicum and widely used in the pGEX family of GST plasmid expression vectors as a fusion protein with foreign proteins. Immunocytochemistry/ Immunofluorescence - Anti-GST antibody (ab19256)Image from Joset A et al, J Cell Biol 188:271-85 (2010), Fig 5. Publishing research using ab19256? Please let us know so that we can cite the reference in this datasheet. Inquiry: 1. Will this antibody recognize GST dimer? 2. I have a GST fused to the c-terminal of my protein expressed in Hela cells. I use 1:1000 dilution. I can see the band expressed from E.coli (using pET3a constructs), but not from Hela (pcDNA5, under CMV promoter). 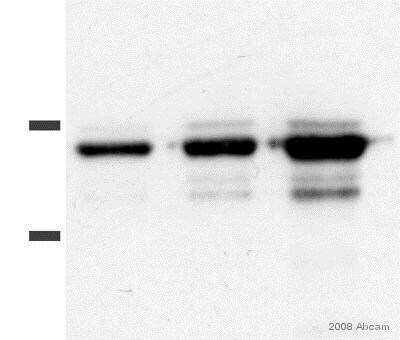 Can you tell me if this antibody recognize that? The ability for an antibody to recognize an epitope tag can be dependent on the recombinant protein and expression system. We do not have experience using this antibody to detect GST dimer. As shown in the datasheet, this antibody has utility in WB applications (reducing and denaturing conditions) and is able to detect recombinant protein (C-terminal tag) expressed in mammalian cells. At dilutions in the 1:15,000 range and also at higher dilutions (data not shown). 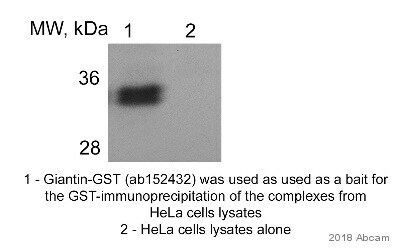 Additionally it is able to detect a recombinant GST-tagged protein in as little as 0.1 ug of cell lysate. New lot of ab19256 gives much weaker bands than an older lot. Thank you for your call today, and I am so sorry that this was not taken care of yesterday. As we discussed, I am sending a free of charge vial of ab19256 on the order ***, which should arrive tomorrow by 10:30am. The FedEx tracking number for this shipment is ***. Please let me know if you have any questions or if there is anything else that we can do for you.